In my review of the First Watt SIT-1 mono-blocks, I said, “If you’ve been an audiophile as long as I have, Nelson Pass is probably nearly a legend to you. I remember in my early twenties drooling over the Threshold amps. In the mid 80s he designed the real bargain amp of the day, the Adcom GFA-555 amplifier. For the past few years I’ve noticed as I attended audio shows, that I consistently enjoyed the rooms that used Pass Labs amplification.” Still, this the first review of a Pass Labs product for me. I have used a couple of Pass Labs phono stages, but never long enough for a review. The reason for this review is kind of interesting. I knew I had a pair of Wayne Picquet’s restored Quad 57 coming in for a while, so I was trying to figure out what amp I wanted to use with them. Years ago when I owned the 57 my two favorite amps to use with them were the Bedini 25/25 and even better, the original 25-watt Electrocompaniet. Both of these were Class A transistor amps. I was not able to find anyone who had either of these two to spare, so I begin to look for a current production amp that was a low wattage Class A amp. There were less choices available than I had expected, but the just released Pass Labs XA30.8 looked perfect on paper. When you combined this with the fact that one of the constants at audio shows is how good rooms with Pass Labs amps sound, I requested an XA30.8 for review and the people at Pass Labs were nice enough to send me one. In fact, they were so quick getting it to me that I had the XA30.8 in before the Quad 57 arrived. Even though 30 watts is a bit of overkill for my 104 dB efficient Teresonic Ingenium XR Silver, I decided to start the review using it with them. 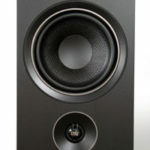 I also used the XA30.8 with the new 47 Labs Alnico Lens II bookshelf speakers and the Audio Note K/SPe. 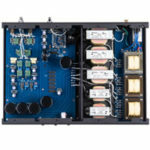 Pass Labs’ new line of amps, the “XA.8” are designed to bring us amps that are even closer to the company’s “Xs” amps. Pass Labs says the “XA.8” amps were issued to celebrate the company’s 23rd Anniversary. The output stages of the .8 amplifiers bias more deeply into the Class-A operating region. The XA30.8 tops out at 40 volts and 20 amperes and like all the other XA models, produces 26dB of voltage gain. Their larger push-pull Class-A operating area is said to deliver lower distortion and additional loudspeaker control at ordinary listening levels. With the XA.8 they also uniquely molded each model’s front ends to the specifics of its output stage so that the nine amplifiers’ front ends vary in size, voltage, bias current, dissipation, and single-ended vs. push-pull bias distribution. They also used larger power supplies, more storage capacitance, more precise reference voltages, and new, larger heat sinks. The amp is really heavy and the heat sinks are fairly sharp, just a word of warning. The look of the Pass Labs XA30.8 has changed somewhat from the XA30.5. The faceplate in particular has changed. For last few years Pass Lab amplifiers have looked a lot like the X.5 series which has a two-part face plate. The front section had a circular opening framing the large round bias meter which was mounted on a second sub panel. Now, only the X.5 line retains this two-piece sculptured look. I’ll be honest, I really thought they looked classy. While the new XA.8 series looks really nice, I still liked the older look. The XA.8 series has a simple .75-inch front panel that is a single slab of aluminum with beveled edges and the large round bias meter centered on the front face. The meter shows the current draw of the amp. When the XA30.8 amp is operating in Class A the needle stays at 12 o’clock or very close to it. When the amp goes out of Class A the pointer may move to the right. It never did this with any of the speakers I used, regardless of how loud I played them, and I like loud music. The only button on the Pass Labs XA30.8’s front panel is for power but around back you’ll find both unbalanced RCA inputs and balanced XLR inputs. It comes with U shaped jumpers in the XLR sockets. If you chose the RCA inputs then the XLR input sockets must have the U shaped jumpers connecting the input pin 3 to pin 1, ground. You will also find four massive speaker cable binding posts that unlike the X.5 amps, they do accept banana plugs, the main AC power switch, a 5 Ampere fuse socket and below the fuse is an IEC power cord receptacle. The last thing on the back is the one I was most thankful for, two big, heavy weight handles. Come to think about it why doesn’t everyone put them on the back instead of the front. My reference system consist of the AMG Viella V12 turntable, Soundsmith SG-220 Strain-Gauge cartridge, Emia Remote Autoformer, Teresonic Ingenium XR speakers with Lowther DX4 silver drivers, High Fidelity Cables CT-1 and CT-1 Ultimate Reference interconnects, speaker cables, and power cables plugged into a HB Cable Design PowerSlave Marble. The amp the Pass Labs XA30.8 replaced was my beloved Wavac EC-300B with NOS Western Electric 300Bs and NOS Western Electric front end tubes. When I say beloved, I like this amp so much that I built my system around it. With a shipping weight of 106 pounds the hardest thing about setting the Pass Labs XA30.8 up was unboxing it and getting onto my Box Furniture Company D3S Audio Rack. With it in the system I plugged an iPod into the Emia Remote Autoformer and let it play for the Labor Day weekend. I figured I got about 100 hours on it while I watched baseball, college football and enjoyed a day in the Napa Valley. It continued to slightly improve for the next couple of hundred hours. The Pass Labs XA30.8 amp requires a lot of power; it draws 375 watts from your AC. So, it should be no surprise that it takes a while to break-in. This amp was brand new and when it was first turned on it’s got the new electronics smell that I have noticed before with some new equipment. By the way when it goes away the amp is more than half way broken-in. Now don’t get me wrong the XA30.8 sounds great right out of the box but just slightly veiled. These veils will be lifted with time. Warm-up is an issue I seldom talk about. My Wavac EC300B sounds great in about 15 minutes and I never turn off my Electrocompaniet in the other system. Because of the heat and draw of the XA30.8 you will probably want to make use of that standby switch. The amp takes nearly an hour to come to life when coming out of standby but if you turn it completely off with the switch on the back, then it’s a different story. It takes at least half a day of playing to come around. Happy New Year Jack and thanks for a great review. Various Pass Labs products are the POTY on several online audio sites. Gosh Jack there you go again reviewing an amp that I would not have suspected you to give such a positive review. Well OK I just sold my 30.5’s and invested in 300b mono’s BECAUSE i have no mind of my own and I listen to equipment reviewers! BUT since you were the guy that directed me to the Devore 96’s I would like to know how THEY sound with the 30.8’s? By the way I love your reviews! A final coment…I have had the 30.5 Pass amp with reference 3a decapos for a couple of years and the pass amps were flat dimensionally; at a reviewer’s encouragement I bought a pair of 300b mono block audio space amps and they WERE much better 3 dimensionally that the pass 30.5! 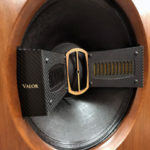 Here is the question amps/speakers are synergistic HOWEVER sometimes it seems that reviewers give special treatment to long established companies (i.e. Pass). Well Charlie no where in the review did I say the 30.8 is better than my Wavac or even the First Watt SIT ones. I said if that wasn’t enough power these would be a great choice. By the way the 30.8 is a huge step up from the 30.5 and I can’t really imagine a $6500 SET with anywhere near this much power that would be as good. By the way I was surprised how much I like them with my speakers, but I needed them because there is no way I would ask my amp to power and impedance load like the Quad 57s have. I too am a fellow Wavac EC-300B amp owner. Every amplifier review of yours gets me excited because you are ultimately going to compare it against the Wavac. At this point I was looking to get a more powerful amplifier because my Tannoy would love it. Another audiophile friend named Myron told me that you are actually now finding the Pass XA30.8 almost as good as the Wavac, please correct me if I am wrong. The only other amp I had in mind was the Lamm ML2. Have you ever heard a Lamm SET ? Can you please give me some idea of how a Lamm SET will differ compared to the Wavac ? BTW, the best thing about the Wavac is it really disappears from the system when it is playing (except when it compresses during loud complicated passages). This disappearing act has made me its addict. If I’m not mistaken the Pass XA30.8 actually does a lot more than 30 watts but passes into class AB to do it. Pass, being a really honest company only advertises its true class A rating. I recall a friend in the business who bought an integrated Pass class A amp and was worried the 30 watts was insufficient. He talked to the company and they told him that it put out at least 60 watts, if I recall, when it went into AB. Allen, thanks for reading my reviews. According to Pass on literature the amp puts out pure class A up to 61 watt peeks. Even with the inefficient Quad 57 ESLs I never saw the needle on the meter move pass center which indicates it never left class A. My current system consists of preamplifier plinius M8 and amplifier SA201 to attack loudspeakers dynaudio C2. I am evaluating the possibility of replacing the SA201 by the amplifier XA30.8 pass. What is your opinion on this? David, I’ve not heard any of the equipment you mention in my home. It sounds like a great system though. I find the XA30.8 very powerful a 30 or eve 60 watt amp, but if you need the kind of power you have now you may want to look at the monoblocks. Sorry, I can’t be more help. I am a high end audio distributor in New Zealand (Parmenter Sound) and represent Pass Labs, WAVAC & Lamm Industries. I have owned 2 WAVAC EC 300B amplifiers over the years matching them with Avantgarde Acoustic Duo Omega loudspeakers. The WAVAC EC 300 B is one of my personal favorite Single Ended Triode amplifiers along with the Lamm Industries ML2.1 (now the ML2.2) SET amplifiers. I have matched the Pass Labs XA 30.5 with the Avantgarde Duo Omega loudspeakers and I must say this was my favorite solid state amplifier / Avantgarde Duo Omega loudspeaker combination, I am sure the new Pass Labs XA 30.8 would be another step up in sonic performance. Jack I really enjoyed reading your Pass Labs XA 30.8 amplifier review and can relate to your impressions & sonic comparison with the WAVAC EC 300 B amplifier, both true reference amplifiers. Jack a wonderful review on the Pass Labs XA 30.8 amplifier. Thanks Jason Parmenter. I’m also using the XA 30.8 with Avantgarde Duo Omega loudspeakers, which are actually a weird load for a transistor amp. Remember how robust transistor amps can double their max output power when the speaker impedance is cut in half? What happens to the max output when the speaker impedance doubles? The Duo Omegas have 17 ohms nominal impedance and 107 dB sensitivity. That means the power amp is putting out just a trickle of current, which it must control to a correspondingly tighter tolerance. One reason I point this out is that my results are based primarily on this odd speaker load. I compared the XA 30.8 head-to-head with a 30.5, a McIntosh Mc275 (using 16 ohm taps), a Cary 300SE with huge auxiliary factory capacitor banks and running WE 300Bs, and a couple of other miscellaneous, less-stellar amps. Bottom line: The best of the lot was and is the 30.8. Second best was the XA 30.5, but it was a fairly distant second. The 30.8 is just plain magical with the Omega Duos. It has more presence and immediacy without a hint of harshness or stridency. I should add that the guys who love tube, and especially SE triode, sound, should audition the Pass Labs XP-30 preamp. It combines the tube bloom with solid-state grunt. It made a bigger difference replacing a Levinson 326S than the power amps did. And I Loved the Levinson. Of course, the XP-30 is expensive and takes up a lot of shelf space with its 3-box footprint. The only Pass Labs component I’m just okay with is the XP-25 phono preamp. I’m experimenting with cables to see if I can improve it. 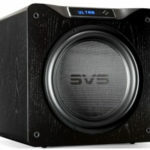 I bought a Pass XA30.8 unheard, based largely on this review and the fact that multiple other writers also bought this amp after reviewing it. I love tube tone and was exploring 300B options because I was dissatisfied with the ambiguous soundstage sorting of my $1500 EL34 amp. The knowledge that Jack ultimately switched from a high-end tube amp made me consider solid state for the first time. I am writing to say that this Pass amp is far better than I imagined. Its clarity, reverb presentation, realistic instrument tone, sharp image placement, and ability to scale the soundstage are just stupendous. I never realized an amplifier could have this level of impact on the music and the speakers (Harbeth P3ESR). It’s utterly transformational; my entire digital collection sounds like master tapes. I listen to jazz/classical/blues. I actually feel it’s a steal at this price. I would not be surprised if it sold for $20K. It will take the cost of a luxury car to better this amp’s performance, and that’s not something I’m about to do. A few notes from my experience: 1.) Upon being plugged in it takes a full 48 hours for this amp to come alive. It’s a big let down until then. But when it finally heats up the improvement isn’t incremental, it’s an entirely different amp. 2.) The heat output isn’t nearly so much as I was led to expect. The heatsink is quite hot but it puts off the same level of heat as my 8 watt tube amp. Very manageable. 3.) I find the amp quite resistant to the power line noise that occurs between 5pm and 11pm. It sounds the same then as it does at 3am. Thank you so much for the XA30.8 and XA60.8 reviews, Jack. I found your assessments to be spot on. This was a tremendous purchase that has brought me much listening joy. Really no downsides I can think of. I am very thankful they are selling this top tier piece of equipment at an attainable price (for me).